“I’ve been on both sides of the world,” Conor McGregor said during a Thursday press conference to promote his UFC superfight with Khabib Nurmagomedov. “I’ve been on the boxing side and I’ve been on this side.” Rather than blow off last year’s fight with Floyd Mayweather, where he was stopped in the tenth round by the fighter known as “Money” in the boxing ring, McGregor made it clear to the media that he’s willing to take what he’s learned from the sweet science and bring it into the octagon. 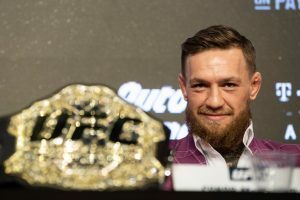 “We are looking forward to showcasing to the world what I have learned from my boxing venture,” McGregor said, “and through my return to mma with this boxing venture.” No one would deny that McGregor certainly benefited financially from his foray into boxing, for the man reportedly earned roughly one hundred million dollars fighting Mayweather. “From the last match,” McGregor said, “I’m set for life.” Nurmagomedov himself enjoyed mentioning McGregor’s bout with Mayweather. “After this fight he goes back to boxing,” the undefeated Russian claimed. When asked directly about the Mayweather fight, McGregor – who loves to taunt his competition during such affairs – became serious and seemingly respectful. “It was a great match,” he said of the Mayweather bout, “it was a great boxing match…30 minutes, my longest contest that was.” The biggest star in mma then went on. “I learned some things,” he added of his ring experience. “Of course you take with you from every fight, you learn and grow. I was very happy with the experience as a whole.” When asked what he thought of Mayweather’s warning that McGregor fears no one, Nurmagomedov had a ready reply. “I am the Floyd Mayweather of MMA,” he said. “You’re a door box.” McGregor snapped back.